The Detroit Lions have come to a deal with former Seattle Seahawks slot cornerback Justin Coleman, as reported by Tom Pelissero on Monday. Coleman’s four-year $36 million deal with Detroit will not only make him the highest-paid slot cornerback in the NFL, but it will also reunite him with ex-Patriots Defensive Coordinator Matt Patricia, who Coleman served during his first two seasons in New England. The move will go a long way in securing the slot cornerback position for Lions in 2019, a position that was somewhat of a weak spot last year. During the 2018 season, Nevin Lawson — who was released on Monday — led the team with 389 slot coverage snaps, yet his 63.8 overall grade and his 62.5 coverage grade respectively ranked 56th and 57th among the 97 defensive players with at least 100 slot coverage snaps last year. During his time in the league, Coleman has proved to be one of the better options at the position. He’s recorded single-season coverage grades of at least 75.0 in each of the last two campaigns, while his four-year slot coverage grade of 79.1 ranks seventh among cornerbacks with at least 500 slot coverage snaps over that span. When targeted as the primary slot coverage defender during his career, Coleman has allowed 96 catches from 154 targets for 1032 yards, four touchdowns, and three interceptions. He’s allowed a passer rating of just 82.5, forced an incompletion on 13.0% of those targets and allowed an average of just 1.09 yards per slot coverage snap, which rank sixth, eighth and 14th among cornerbacks with at least 100 targets in that span, respectively. 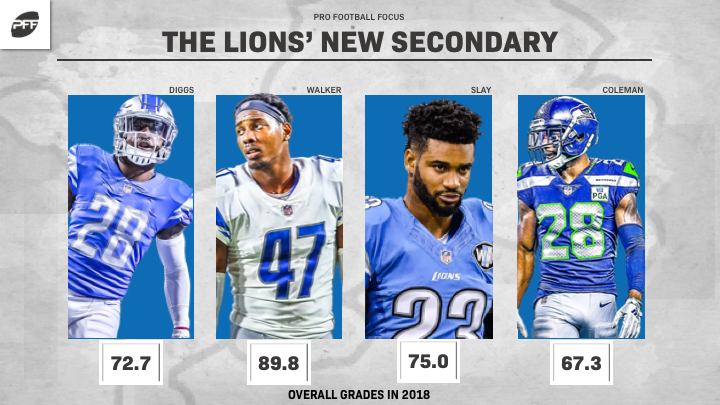 The Lions will now add Coleman to a secondary that had its fair share of talent to begin with, but now that he’s teamed with safety Quandre Diggs (72.7 overall grade in 2018), safety Tracy Walker (89.8) and cornerback Darius Slay (75.0), the unit will be a fun one to watch going forward.